To be completely honest I really don’t like any of the vegan French Toast recipes that I have tried. They all call for chickpea (garbanzo) flour which can be difficult to get (never mind expensive!) and are kind of a pain in the but to make. Instead of chickpea flour, I have my own secret french toast ingredient. It’s arrowroot. Long ago when I was starting out as a vegan, I read in one of the punk rock diy cookbooks I had (It was either Soy! Not Oi! or Please Don’t Feed the Bears…if you are familiar with them both you might see why I get confused about which one’s which sometimes) that arrowroot was a great vegan pantry staple ingredient to always have on hand. Unfortunately, it can sometimes be tricky to find in large quantities. However, I buy it in a big bag from Bob’s Red Mill online. Arrowroot is a cornstarch substitute, but unlike cornstarch, supposedly it is more easily digested. Plus, thinking about the cornstarch and water mixture I used to love to play with as a kid going into my body scares me…that being said, if you want to make this delicious French Toast recipe right away and do not have arrowroot on hand, go ahead and use cornstarch. It’s a fairly small amount, and works exactly the same. In a medium but shallow bowl or container, mix the powders together. Whisk together until it’s no longer clumpy. The thickness should be that of a typical french toast batter, but if you’ve never made french toast before, I’m not sure what to compare it to. You want it to be thick, but not the thickness of a pancake batter, but not too watery either. If the thickness doesn’t seem right, add 1/2 tbsp flour until you get the right texture. Heat a griddle or large frying pan on the stove on medium heat. 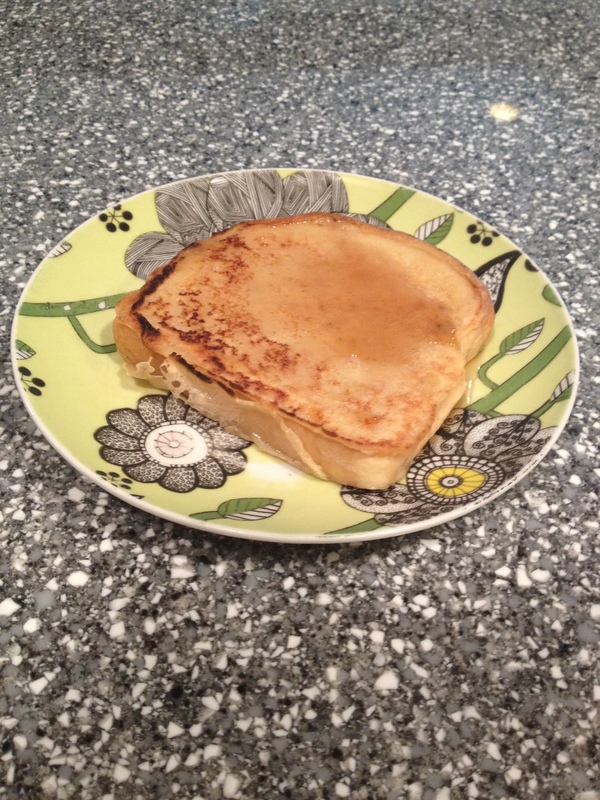 Once the margarine is melted, dip both sides of the bread in the batter and place on the griddle. Repeat until all the batter is used up or do like I did and save the batter for later by covering it and placing it in the fridge (you will need way less margarine if you only do 1 or a few slices). Cook on each side, at least two minutes each, but go by the way it looks, you want it to be crispy and golden with some brown spots. Voila! You can nom on it now! I put some maple syrup on top. Powdered sugar would also taste delicious! ← Laura’s first ever original recipe: Baked “Honey” and Lavender Donuts!